Feetology employs a team of highly skilled podiatrists focused on solving your foot concerns. All of our podiatrists begin their career with a four year university degree, and advance their knowledge by regularly attending workshops, conferences and seminars. This commitment to ongoing learning and development ensures that we have the best and most up-to-date skills and techniques to help you get back to the things you love to do. 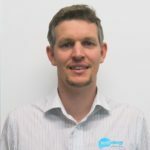 Mark Caldwell graduated his podiatry studies from Queensland University of Technology in 2000 and has been working in private practice in the Redlands since 2001. His first introduction to podiatry came as a nine year old competing in ‘Little Athletics’ carnivals. His heels would be so sore at the end of an athletics carnival that he would be walking on his tip-toes to alleviate the pain. Podiatry got him back on the track and kept him sprinting through athletic competitions at school, state and national levels, as well as a few decathlons along the way. Mark is an Accredited Podiatrist and a member of the Australian Podiatry Association. He attends many conferences and workshops to advance his knowledge. Mark is particularly interested in the area of musculoskeletal pain of the foot and lower limb and incorporates joint mobilisation and manipulation, and dry needling into his treatments. Mark is a “local”. He created Redlands Podiatry in 2006 and is committed to keeping Redlands residents pain free and active so that they can continue to enjoy life and all that the Redlands has to offer. Mark is proud of the well regarded, bustling practice he has built. Camille Ciottariello’s introduction to podiatry came at the age of 15 after ongoing ankle injuries whilst playing netball. Podiatric intervention got her back on the court and into the winning grand finals team. After having this personal experience, she chose to help others with foot, ankle and lower limb problems. She studied podiatry at QUT for four years to graduate with honours and become a Podiatrist. Camille has been helping people to get back on their feet for two years and joined the Redlands Podiatry (now Feetology) team in May 2014. Camille is an accredited podiatrist and a member of the Australian Podiatry Association, and is devoted to ongoing professional learning attending many courses to advance her knowledge in musculoskeletal pain, paediatric, surgical, geriatric and diabetic podiatry. She keeps active enjoying recreational tennis, netball and has a love of shoes (and a collection to rival Imelda Marcos’). Tracy Johnson graduated her podiatry studies from Salford University Manchester with first Class Honors in 2006. She began her podiatry career in the UK, and made the move to Australia in 2017 . Tracy was drawn to podiatry as she had previously suffered from a knee injury which prevented her from running. She saw a Podiatrist who diagnosed flat feet and prescribed orthotics, and after a few months she was able to run again. The feeling of being able to train again pain free was amazing and she wanted to help people in the same way. Tracy has also completed a Diploma in Sports Massage Therapy and uses these skill to provide a holistic treatment to her patients in a fun and relaxed atmosphere.